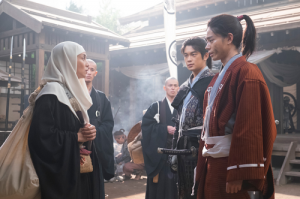 To those who read the post on Taiga Drama in English 12 "Taiheiki" and "Homura Tatsu"
I write about three Taiga Drama series, "Onna Joshu Naotora", "Samada Maru" and "Furin Kazan" now. 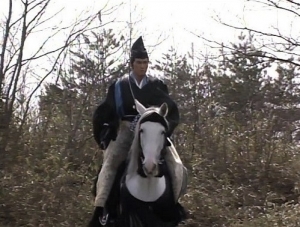 I will finish the posts on "Sanada Maru" soon and the broadcast of "Onna Joshu Naotora" will end on the 17th of December. 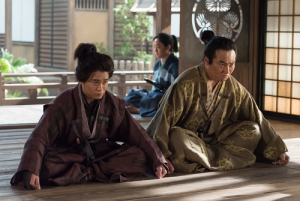 Hiroyuki Sanada as Ashikaga Takauji in "Taiheiki"
I plan to post the episodes on "Sego-don", a new series that is to be broadcast next year in parallel with those of "Furin Kazan". And I also plan to write about "Taiheiki", a chronology of the Middle Ages mentioned in the post about hitatare and "Homura Tatsu", the nine-month series that describes Oshu Fujiwara clan, a powerful family from the ancient times to the Middle Ages in northern Japan. If possible, I'd like to introduce "Mori Motonari" that describes a daimyo who hold supremacy in the Chugoku region in the 16th century also. Ken Watanabe as Fujiwara no Tsunekiyo in "Homura Tatsu"
Especially the series produced and broadcast from 1980s to 1990s are excellent and still attract many viewers. 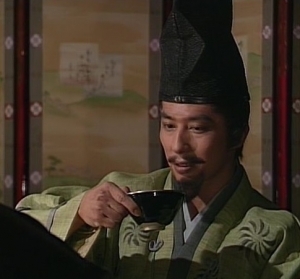 So the fans of such traditional series tend to regard recent ones are not Taiga Drama series but cosplay or modern dramas set in the Sengoku period or Tokugawa shogunate. I think it's true in a sence and hope the producers and scriptwriters will go back to the basics in the near future. 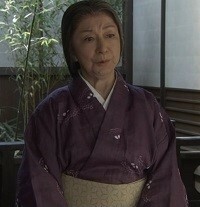 The images are from the DVD series of "Taiheiki" and "Homura Tatsu". UESUGI Sadazane was a shugo of Echigo and an uncle-in-law of NAGAO Kagetora, later Uesugi Kenshin. As he wasn't from the family that succeeds the shugo of Echigo, he married a daughter of Uesugi Fusayoshi who was a shugo of the provicnce. Then he made Fusayoshi fall from power with depury shugo Nagao Tamekage, father of Kagetora and remarried his sister. Later Echigo was invaded by Kanto Kanrei Uesugi Akidsada, he and Tamekage recover military strength and beat Akisada at the Battle of Nagamorihara in 1510. 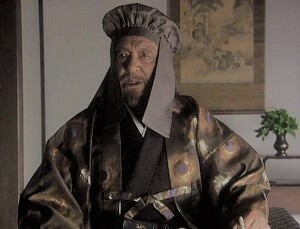 But in 1513, he was dissatisfied with Tamekage who held real power to rule Echigo. He set off some riots against him with his brother JOJO Sadanori and his vassals. Finally he was forced to retire but after that his comrades in arms made Tamekage lose his position. As Harukage, who succeeded his father was a mediocre man, he dealt with him though he couldn't hold the power again. Around 1538, he was recommended to receive Tokimunemaru, son of DATE Tanemune (*) as his adopted child because he didn't have any son. 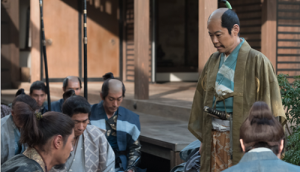 However a battle between the ruler who opposes it and the Date clan broke out and it involved the rulers in norther Echigo and Dewa, current Yamagata and Akita. Besides a conflict occurred in the Date clan so the adoption was cancelled. Then he made Kagetora, who suppressed the insurrection of KURODA Hidetada, one of his vassals succeed Harukage. After his death in 1550, Kagetora was ordered to succeed him by ASHIKAGA Yoshiteru, the 13th shogun of Muromachi Bakufu (**) and became the lord of Echigo. (*) He was a great-grandfather of Date Masamune. (**) Shogun had certain amount of authority even in the Sengoku Period.